Fall birthday party themes and ideas from Halloween costume parties to fall camping adventures. Here are some ideas for throwing a Fall Birthday Bash for your kids. It’s the start of the football season, it’s harvest time, and Halloween is afoot. But all those seasonal celebrations pale in comparison to your little one’s birthday. This time of year offers plenty of party inspiration for fall babies. All kids love Halloween, but they also hate how quickly it’s over. You can make the fun last a little longer with a costume party. 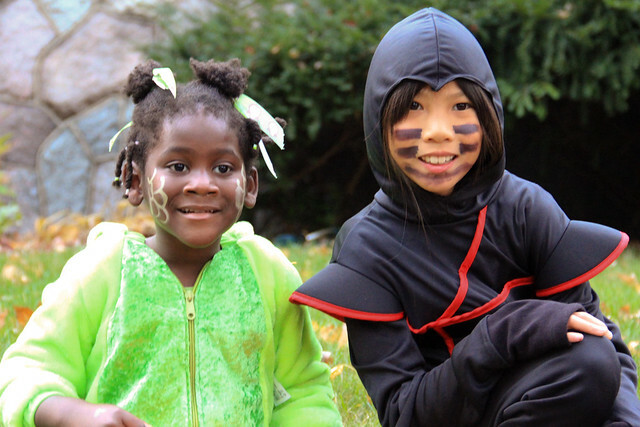 Other parents will love the opportunity to recycle this year’s Halloween outfit, while the kids will enjoy showing off their costumes to their friends. Continue the Halloween theme by reusing your holiday decorations and laying out some spooky snacks. The kids could also tell ghost stories and bob for apples to get into the holiday spirit. A smoothie station is a delicious and healthy way to celebrate the season’s fresh produce at your fall birthday party. Make sure yours is fully stocked with an array of fresh fruit. New season apples, cranberries, grapes, and pears all work wonderfully in smoothies. Let the kids choose their favorite flavors, and keep some yogurt and honey on hand to finish their creations. Scotsman ice machines which flake ice, rather than simply cubing it, will give your smoothies that professional juice bar taste. This fall-inspired game of bowling is much trickier than it sounds. Line up some used soda bottles as pins. Adding a little water to the base will stop them blowing away on a windy day. Then the kids will take turns trying to knock the pins down with a rolling gourd. They’ll all be in stitches watching the unevenly shaped gourds rolling every way but the right direction! Scarecrow cookies are perfect for any fall birthday with a harvest or Halloween theme. And you won’t believe how simple they are to make! First cover the top of your kid’s favorite cookie with some simple white frosting. This will become your scarecrow’s face. Then halve a sugar wafter, and stick it to the top of the cookie with a dollop of frosting to form the top of a hat. Place a whole sugar wafter just underneath this to form the hat’s brim. You can decorate your hat with slices of candy corn, mini chocolate chips, or other candies. Some more frosting will help these adornments stick. Then make your scarecrow’s face with mini choc chip eyes, a candy corn nose, and a chocolate sprinkle mouth. Pieces of bran cereal make realistic looking straw hair. Older kids can take advantage of fall’s temperate weather conditions with a campfire-themed birthday. They’ll love the little bit of independence they feel as they camp out with close friends under the stars. Make sure you tell your guests to bring a sleeping bag and pillow, and source some extra tents from friends. Popcorn and trail mix will fend off hunger pangs until you cook up some hot dogs for dinner. And no camping trip would be complete without roasting s’mores and drinking hot chocolate around the fire. No matter what your child’s tastes, fall offers tons of inspiration for a memorable birthday bash.